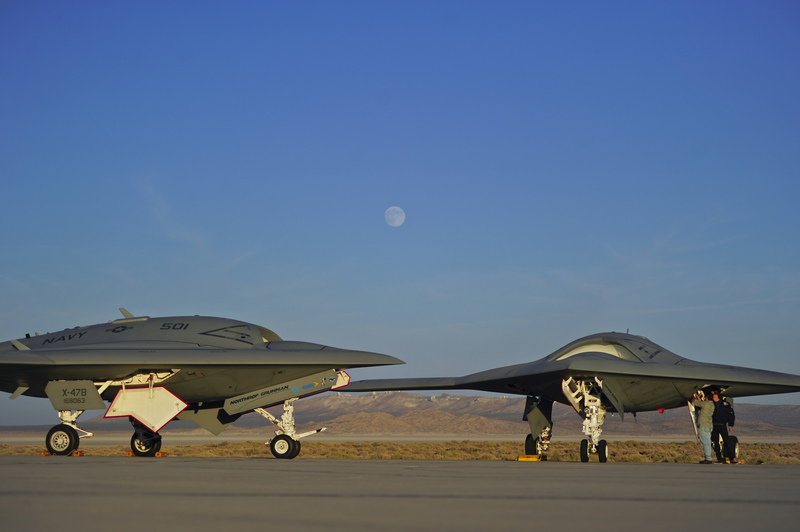 Nearly three years ago, the Navy and defense giant Northrop Grumman Corp. unveiled the X-47B unmanned air system in Palmdale, Calif., showing off the bat-wing-like tailless and pilotless autonomous bomber that is designed to take off and land on aircraft carriers. In February, the first air vehicle made history when it completed its first real flight, a half-hour mission over the California desert. On Nov. 22, the second air vehicle, known as AV-2, took off in the hazy blue skies at nearby Edwards Air Force Base and flew up to 5,000 feet as it cut some race patterns over a dry lakebed before landing to wrap up a successful 27-minute flight, according to Northrop Grumman, the program’s prime contractor. That first flight of the second demonstration aircraft will propel the program closer to actual flight deck landings and carrier trials that are planned to take place in 2013. But first, there’s at least a year’s worth of flight testing at Patuxent River, Md. “With two aircraft now available, we can increase the amount of aircraft performance data we gather, which will allow us to meet our required aircraft capability demonstration goals in a timely manner,” Carl Johnson, Northrop Grumman’s vice president and program manager for its aerospace systems sector, said in a Nov. 28 announcement. The company will send one of the air vehicles to Pax River by the end of this year, where it will continue with flight and systems testing that will eventually lead to the X-47B’s first carrier shot and trap.